Carrie Underwood had a bundle of happy news to share with fans on Wednesday morning (August 8). For starters, she announced the dates for her Cry Pretty Tour, which will be in support of her upcoming album of the same title. There will be a wealth of girl power on the tour, as the supporting acts will be duo Maddie & Tae and the all-female group Runaway June. The show will feature a special 360 degree stage, which will result in a more immersive concert experience than Carrie’s fans have ever seen. Carrie’s Cry Pretty Tour will kick of in May 2019, and will take her to cities all over the U.S. and Canada. 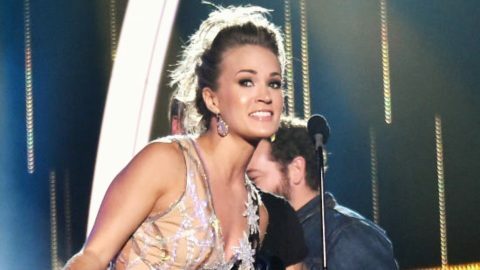 You may be wondering, why would Carrie wait so long to head out on tour? Well, that has to do with some other big news that she shared in an exciting announcement video on social media. Carrie is going to need a little time before she heads out on the road because she’s waiting on a new crew member to arrive. That’s right, she’s pregnant! This will be the second child for Carrie and her husband Mike Fisher, who recently retired for the second time as a player for the Nashville Predators hockey team. But even though Fisher is no longer playing for the Preds, he will always be a part of their family. So when the baby news reached the team’s mascot Gnash, he quickly jumped in to congratulate Mike and Carrie. Congrats to @mikefisher1212 and @carrieunderwood on the wonderful news! I am thinking Gnash Fisher for a boy and Gnashley Fisher for a girl. Hopefully Carrie and Mike don’t listen to those suggestions. Perhaps they’ll continue to follow a biblical route like they did with Isaiah’s name? Only time will tell. One thing’s for certain, the new baby is sure to be adorable! Look back on some of Isaiah’s youngest photos in Carrie’s video for “What I Never Knew I Always Wanted” to get an idea of what the new baby may look like. A huge congratulations to Carrie, Mike, and Isaiah on their upcoming addition!